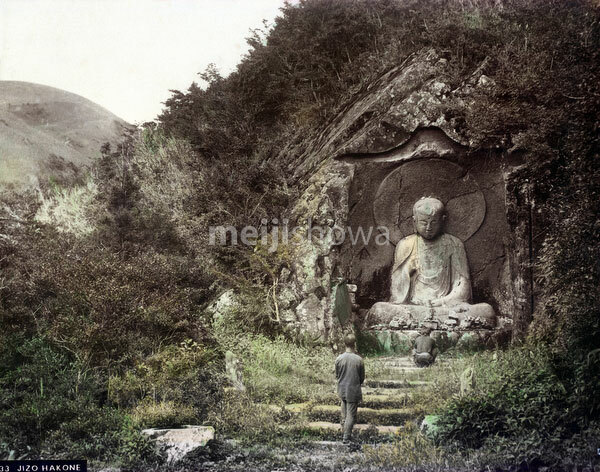 Men Praying at a statue of the Buddhist deity of Jizo in Hakone, Kanagawa Prefecture, ca 1880s. Known as the Rokudo Jizo (六道地蔵), it is a 3.5 meter tall Buddha figure carved on a rock face (磨崖仏, magaibutsu), dating from the Kamakura period (1185-1333). The statue faces Lake Shojin (精進池) at the foot of the Mt. Kamifutagoyama (上双子山).